Recensione Boston Advance Conditioning Solution Prezzo decisamente alto per la confezione singola, ma prodotto ottimo. Comprato a integrazione della confezione multipla dato che non riesco mai a finire contemporaneamente il flacone di detergente e conservante, quindi il prezzo alto si ammortizza. 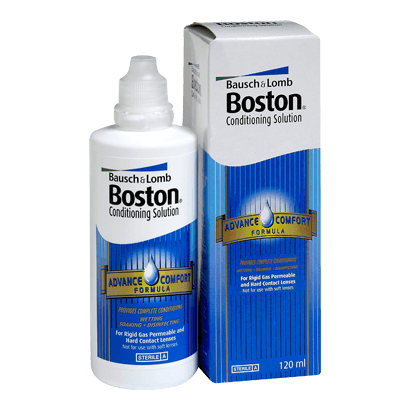 Review Boston Advance Conditioning Solution My husband has used this product for years and now we live in France this is the easiest and most convenient way to buy it. Next day delivery to France was very impressive! Review Boston Advance Conditioning Solution I only buy this singly on occasions when it's run out before the cleaner in the multipack. Pity they don't offer a 100ml size as it would be useful for travelling by air and could be carried in hand luggage. Boston Conditioning Solution I always rinse my lenses with this solution before I insert them in the morning and it has made quite a difference in how comfortable they stay during the day. Boston Conditioning Solution I use this conditioning solution together with the cleaner and am really happy with the results. My lenses are comfortable for longer. Using a unique concentration of multi-purpose solution and intensive wetting agent, the product is able to keep regular users of hard contact lenses comfortable. The Boston Conditioning Solution can be specifically used for the rinsing, soaking and disinfecting of fluoro silicone acrylate lenses, silicone acrylate rigid gas permeable (RGP) lenses and hard contact lenses. By reducing the deposits and impurities that gradually build up on lenses, the solution reduces irritation. To use simply add two to four drops of the solution on each lens. Carefully rub in the solution for 20 seconds to diminish the impurities that can gather around lenses. This will leave hard lenses feeling comfortable and moist, allowing a far greater level of comfort.